Ice dams are caused when warm air escapes into your attic and heats the underside of the roof deck. The snow on the heated part of the roof melts and flows down until it reaches the part of the roof that is freezing. (Typically above the soffit.) The water freezes and forms an ice dam. 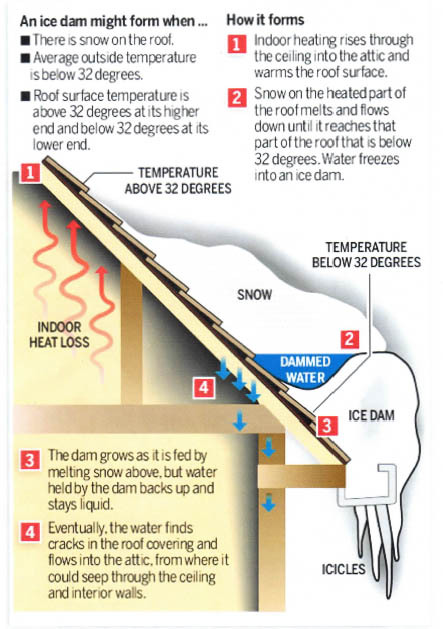 Water builds up behind the ice dam and eventually finds its way into cracks in the roof covering and into the attic and ceiling spaces inside the house. A sure sign your home may be suffering from the effects of an ice dam are icicles hanging from your roof. At Corriveau Contracting our professional contractors will help you understand the causes and possible remedies. The temperature of your attic should be as close to the temperature outside as possible. Corriveau Contracting also performs snow removal and ice dam removal during the winter months. For a free consultation, call Corriveau Contracting at 603-880-9988.